Hey guys! How’s it going on?! I know it’s been a while ever since I posted anything related to Naruto or Boruto but I was pretty busy with some other stuff. Also, nothing big was happening in the Boruto anime but I will always make sure to keep you updated with all the important stuff. Don’t worry about that! I’m here for you guys! Okay, so I have some pretty hot news for you guys. The people who are reading the manga must know about it that a certain someone has been revealed in the latest chapter of Boruto. Well, yes, as it is clear in the title, Boruto Manga Chapter 23 has finally revealed the most anticipated and mysterious villain of Boruto – Kawaki! If you don’t know who Kawaki is. Here you go – Kawaki is a young man theorised to have some connection to Kara.While much is unknown about Kawaki’s personality and views, he is shown to be a sombre man with a detached and dark outlook. Seemingly despising shinobi, he is determined to end their era. Well, that may be the case as we were shown Kawaki battling Boruto in the start of the Boruto manga / anime but there’s something off about him as we saw just saw him in the manga. Okay, let’s start on the whole scene and obviously the manga left us at a cliffhanger about Kawaki’s details and stuff. Well, let’s see it for starters! So after the fierce battle with [Spoiler] (I don’t want to spoil it, I will make an article about the details with fight later tonight!). After the battle, as the team is heading back, Mitsuki notices something very strange. His instincts were telling him something and they were right. There was something shocking the team encountered. Seems like Mitsuki was correct and they found another puppet, the team was fighting before at the airship. For the non manga readers, this puppet was extremely tough and very hard to fight as well. Defeating one isn’t an easy feat. As said, the crash site is still far so how come this puppet is here? Seems suspicious, doesn’t it? The team goes around to check the puppet and the surrounding area. Normally, even if you defeat the puppet, as it is a ninja tech device, it’s bound to be heated up during it’s activation / running process. So as the body is cool instead of being warm / heated up, it’s been a while since it was defeated. But who could defeat this puppet? As Sarada states, the team even including Konohamaru and Mitsuki, couldn’t even put a scratch, yet defeat it. So who in the world could even defeat this monstrous puppet ninja tech?! Even Konohamaru acknowledges that whoever did it had to be someone with incredible fighting power. This has left Boruto speechless too. They’re getting scared. Then, just at the climax, the dog, chamaru starts barking. Yes, guys, this is the moment you all were waiting for. We are finally gonna meet the person who caused the biggest uproar and confusion in the Naruto fandom / community. 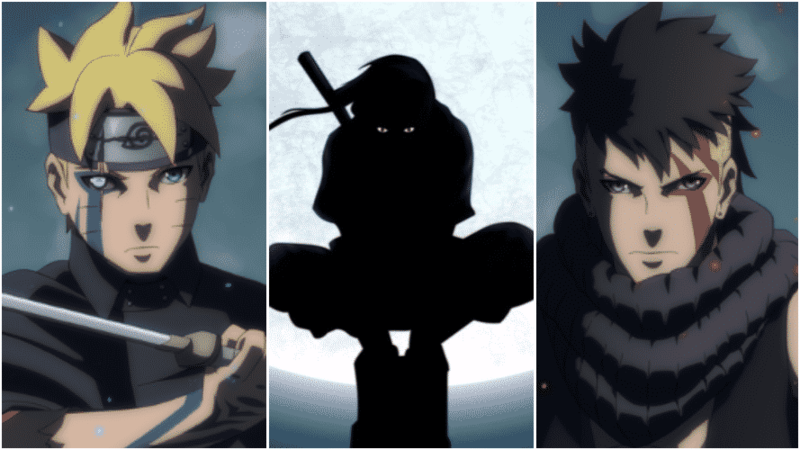 Boruto, finally meets the person destined to fight him in the future, the person named – KAWAKI!! Finally Kawaki has been revealed and he has the same symbol as Boruto in his other hand. This really surprises Boruto. He is not in a good shape but is still alive. From what we can see, Kawaki is the one who took care of all these puppets. This just shows HOW STRONG he really is! Maybe he used the power of the symbol or something? Next story Vegeta Has Been Voted #1 Best DBZ Character Of All Time! Previous story Oda Reveals Why Sanji Is The Only One To Inherit Blonde Hair!